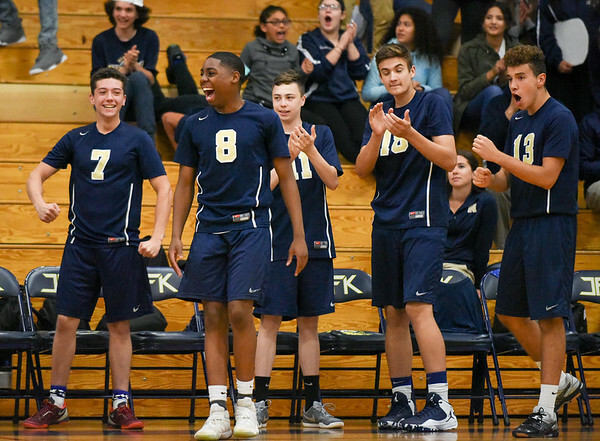 MERIDEN - The spring season is just three weeks old, but that didn’t stop the Newington boys volleyball team from already hitting one of its season’s goals. Behind an easy 3-0 sweep of Maloney Monday afternoon, the Indians collected their eighth win of the year to qualify for the Class M state tournament. Newington (8-1) won by set scores of 25-15, 25-11, 25-21. Louis Egbuna led Newington with nine kills, while teammates Teddy Fravel and Riley Miller had five and four kills respectively. Evan Metzger finished with 25 assists. But it just wasn’t the postseason berth that was important to Burns and his season, it was also about responding to a tough loss to East Hartford at the end of last week. Berlin 9, Tolland 6: The Redcoats jumped out to an early lead which helped them fight off a late rally from the Eagles, who scored three runs in the seventh. Kailey Lacasse went 2-for-3 with a double, triple and two RBI for Berlin as teammate Alexa Lanteri went 3-for-4 with two runs scored. Stefanie Poulin earned the win for the Redcoats. She pitched a complete game, but only gave up two earned runs and struck out nine. Wilcox Tech 16, Goodwin Tech 1 (5 innings): It was a short game for the Gladiators, who committed eight errors in a shortened game and failed to record a hit. Yarliana Moya was the lone bright spot for Goodwin Tech, walking and the stealing two bases. She also scored on Bianca Olivo’s groundout. Manchester 4, Plainville 1: Nate Michalek did everything he could to keep the Indians at bay. The Blue Devils pitcher went six innings, struck out five and even drove in Plainville’s lone run himself. Unfortunately, Michalek didn’t get much help. Plainville managed just five hits, two coming from Jordan Bishop, who also scored the team’s lone run. “Michalek pitched great,” Blue Devils head coach Louis Mandeville said. “He only gave up 1 hit going into the sixth inning. He did a great job of keeping Manchester off balance. Goodwin Tech 13, O’Brien Tech 2 (5 innings): It didn’t take the Gladiators much effort to beat a winless O’Brien Tech team. Matt Anderson picked up the win for Goodwin Tech and was one of a trio of players to collected three hits for his team, including a double, joining Ryan Johnson and Paul Prior. Avon 6, Newington 1: The Indians didn’t have a lot of success closing out matches against the Falcons, but freshman Matt Utter was able to pull out the lone win for Newington. Utter defeated Yefim Gordonitskii in the No. 2 singles 5-7, 6-4, 11-9. “He played extremely well today,” Indians head coach Don Lukowski said. RHAM 5, Berlin 2: Redcoats may be 1-3, but each match they improve. Berlin claimed the No. 1 singles match as Jonathon Trevethan defeated Noah Dubitsky 6-0, 6-0. But then the Sachems swept the rest of singles. Micah Dubitsky went on to beat Thomas Fijalkowski 6-0, 6-1, Brandon D’Amaddio defeated Kevin Stafstrom 6-3, 7-3, and John Miller defeated Noah Mihalko 6-1, 6-2. As for doubles, Will Roser and Grady Habicht beat Berlin’s Wesley Cantliffe and Ryan Jenkins 6-2, 6-1. The No. 2 doubles team for the Redcoats, however, came out on top. Dom Biello and Ryan Cyr defeated Duncan Henderson and Andrew Crowl 6-3, 7-5. RHAM finished off the day in the No. 3 doubles as Wes Roser and Noah Kaiser defeated Jackson Lombardi and James Zovich 6-3, 6-0. Northwest Catholic 6, Newington 1: The Indians also picked up their lone win of the afternoon on a tie-breaking set. Melissa Riggins and Elie Wronka defeated the Lions’ Kalci Goodsin and Isabella Krocheski 6-2, 4-6, 10-7 in No. 1 doubles. Southington 7, New Britain 0: The Blue Knights improve their record to 4-2 after sweeping the Hurricanes. For singles, Abby Murphy defeated Lela Schhvedlidze 6-0, 6-0, Coral Tommervik defeated Sarah Belal 6-0, 6-0, Molly Murphy defeated Larissa Tabb 6-3, 6-1 and Joelle Stublarec defeated Jenny Ketkeoasmy 6-2, 6-4. As for doubles, Carolyn Callahan and Chantelle Gimenez defeated Audrey Belliveau and Zoe Hyres 6-3, 6-1, Gianna Wadowski and Madison Beaudoin defeated Claire Palin and JuJu Oliver 6-3, 6-1 and Emma Wojcicki and Kate Hardy defeated Danya Alboslani and Yajaira Asimbaya 6-4, 6-4. Newington 195, East Catholic 229: It wasn’t much of a match for the Indians. Newington’s Chloe Bilodeau finished the medalist after shooting a 43 at Minnechaug Golf Course. Her teammate, Jessica Pierzchalski, was right behind with a 45. Taylor Kelly (52), Leah Tofeldt (55) and Maddie Massaro-Cook (62) rounded out the Indians’ scoring. Wolcott Tech 185, Goodwin Tech 244: The Gladiators are still looking for a win. The Widcats’ Carter Wheeler was the medalist after shooting a 40. Josh Donaghy was the low scorer for Goodwin Tech with a 57. Jackson Collin (58), Brandon Ketkeorasmy (63) and Logan Stine (66) were the other top scorers for the Gladiators. Posted in New Britain Herald, Berlin, Goodwin Tech, New Britain, Newington, Plainville, Southington on Monday, 23 April 2018 21:30. Updated: Monday, 23 April 2018 21:35.